A growing number of smaller communities around Los Angeles have voted to ban short-term rentals and kick Airbnb to the curb. With the height of summer getaway season fast approaching, a growing number of Southern California communities have shown Airbnb the door. In recent months, city councils from Orange County coastal enclaves to the Los Angeles suburb of Santa Monica have repeatedly voted to ban short-term rentals and, as a result, the use of Airbnb to list a property. 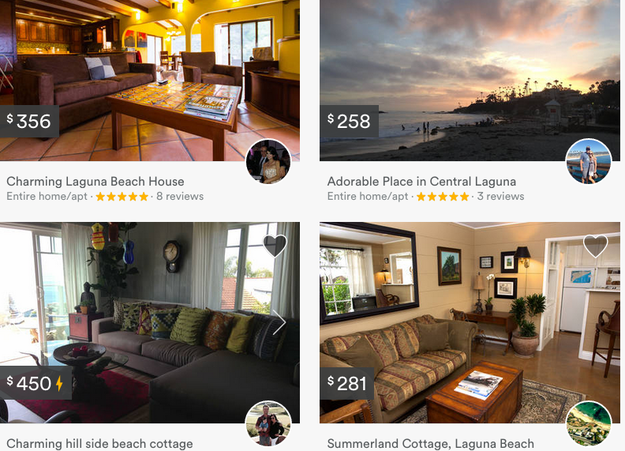 Just last week, the city of Laguna Beach passed a 45-day emergency ordinance imposing a moratorium on short-term rentals in the affluent coastal town, after which it will consider an all-out ban. One problem, Laguna Beach Mayor Pro Tem Steve Dicterow told BuzzFeed News, is that while currently only 60 properties in town have the proper permit for short-term rentals, which requires a business license and paying an occupancy tax, there are 200 properties listed on home sharing websites that do not. But an even bigger concern is the quality-of-life complaints made to the city regarding these properties. “It needs some regulation because there have just been too many anecdotal stories of people not treating the neighbors well, being loud, having late, noisy parties, parking illegally in places, being rude to people, things of that nature,” Dicterow said. The Laguna Beach decision comes just a week after the Santa Monica City Council approved a permanent ban on short-term rentals, or those fewer than 30 days. Despite the fact that the decision spurred a protest organized by Airbnb outside of the City Council, local legislators said complaints of Airbnb causing an affordable housing shortage in Santa Monica were too forceful to ignore. “When we in Santa Monica found that over 1,000 dwelling units that should be homes to permanent residents had been converted instead to de facto hotel rooms, we felt we had to act, and we all felt the same way about it,” Santa Monica Mayor Kevin McKeown said at the meeting. The rules passed allow for “true” home sharing, the LA Times reported, meaning short-term rentals when the owner is present, pays applicable taxes, and is appropriately licensed. Criticism of Airbnb’s effects on the supply of affordable housing has been growing in Los Angeles, New York, and most recently San Francisco, where a report released earlier this month found that between 925 and 1,960 affordable housing units have remained vacant so that they can be rented out on Airbnb and other short-term rental sites like VRBO and HomeAway. In the case of West Hollywood, the most recent municipality weighing an outright ban on short-term rentals, the issue is not affordable housing, but concerns over noise, safety, and renters throwing parties, like the one that recently did major damage to a property in Calgary, Alberta. To investigate, the West Hollywood City Council formed a seven-month-long community involvement initiative called the Shared Economy Task Force that talked to residents, local businesses, and a representative from Airbnb about the possibility of allowing for rentals that were shorter than 30 days. In the end, it recommended the city continue its prohibition of short-term rentals, and will present a clarification of its zoning code laws — violations of which can result in a range of penalties, from a $200 fine to a misdemeanor charge — at the July City Council meeting, where it will likely go into effect 30 days later. Meister said Airbnb was “disappointed” with the task force’s findings. “There were a lot of residents that were very concerned because they already had neighbors using short-term rentals and they were having parties,” Genevieve Morrill, president of the West Hollywood Chamber of Commerce and a member of the task force, told BuzzFeed News.